Creating a great wine requires two critical functions: grape growing and winemaking. Once your grapes have been picked you’ll need a facility to crush, ferment and bottle your wine. This requires a special structure designed for your unique vintage and winemaking process. At Carl Santos Construction we build winery structures that provide optimal space for tank rooms, storage and tasting rooms, and that are aesthetically beautiful in design as well. Creating a space that will help make your wine distinctive is a Carl Santos Construction specialty. This is because Carl Santos Construction designs and builds practical and beautiful barns that help you make great wines. Building a barn for your winery is a process that should be managed with the same attention to detail that goes into creating a high quality wine. We’ll work with you on the design specifications that will make your working space a delight to inhabit, in aesthetic harmony with the surrounding landscape, and high functioning for your winemaking process. A Carl Santos barn will increase the value of your property — for now and years to come. We can use building materials that are eco-friendly and energy efficient. Initially we’ll start with discussions about your objectives and then look at drawings to determine exactly what you want. 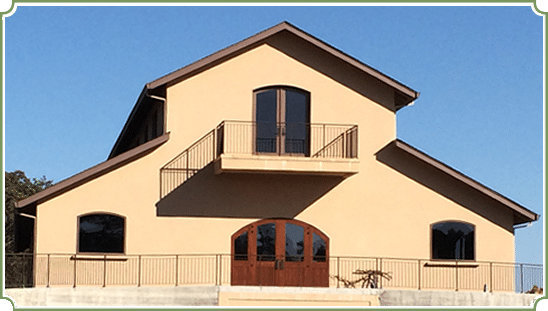 Whether you need a discreet winemaking barn or a facility that can also accommodate wine tasting, we can create a winery building with the form and character to match your style. If you’re looking for a wine-barn builder with years of experience and an eye for fine craftsmanship, call Carl Santos for a consultation on your custom-designed winery barn project.